If you're a regular follower, you may be aware that I'm on another one of those 'trying to be good' jags. If I want to be slim, I have to work bloody hard at it and the minute I stop being good, the pounds just pile on. I was ten pounds lighter when I started this blog. I deluded myself that as I was training for a half marathon in March and responsible for keeping you entertained everyday with my long-winded tales that I had to eat interesting (read higher calorie) things. The gain probably hasn't just been caused by the blog though. Having been in not such a good place, I've been prone to snacking at work too. And of course licking one too many cake bowls. I mean I'm hardly Morgan Spurlock, stuffing myself full of Maccy D's every day. But still, I could've been a little more responsible to myself. So last week, I vowed to myself to make an effort to maintain a food diary, resume my running and reduce the amount of baked goods I've consumed. At the time I figured it meant no bread. Mostly because I am far to weak to resist a slice or several of freshly baked bread, slathered with butter. Yesterday I cracked on that front and realised that I need to follow the old mantra of 'a little of what you fancy does you good'. Pre-baby, I used to fuel my runs with a piece of coffee cake every now and again. I swear in that sugar- and caffeine-fuelled state I ran far better than normally. It was my treat. And because it was only once a month, I savoured it and the intake was balanced by the running. I hit on the idea of making a focaccia because for the amount of flour you use, you get a lot of bread. Plus it can be carved up into bits and popped into the freezer for later. 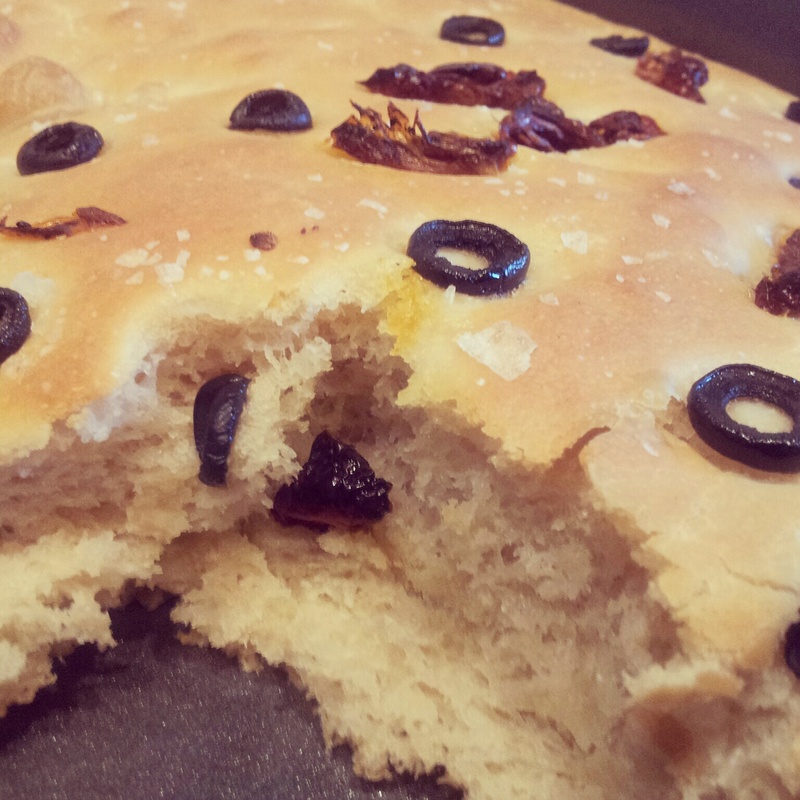 I was then surprised to find that my beloved Dan Lepard book doesn't have a recipe for focaccia. It took me a while to recover from that and eventually settle on the Silver Fox's recipe from the Great British Bake Off book. It was one of the technical challenges in the last series, however it's quite a time consuming recipe and with a full time job, I thought I mightn't get my fix til the weekend. Dan to the rescue. He helpfully points out that you can do an overnight rise in the fridge and just reduce the yeast by half. Excellent. Which is why I was faffing with my stand mixer at about 5am this morning, getting the first knead and rise underway. Anyone who has watched Mr Hollywood in action knows that he mixes everything with his hands. And I mean EVERYTHING. Even runny icing. It's something to do with getting the feel for consistency. Or at least that's what he says. But I didn't have time for ten minutes of kneading. Nor the inclination to do so that early in the morning. So into the fridge it went and when I came home, it was trying to escape from the bowl. The recipe is supposed to make two loaves, but I settled for making one in my large roasting tray. The dough felt bitterly cold whilst shaping it to go into the tin and I was worried that the second rise would take forever but after two hours, aided by some residual heat from cooking Miss A's tea, it was merrily blowing bubbles and rising nicely. Hollywood doesn't put the characteristic dimples in his loaf so I followed suit and instead scattered one end with sundried tomatoes and black olives and then sprinkled the whole thing with Maldon sea salt and a good drizzle of olive oil. Into the oven and oh my gosh my belly was rumbling. Fresh bread has never smelt so good as it does when you're on a diet. Twenty five minutes later and I had to cut the first square out and eat it straight away just for research purposes of course! Luckily, I'd been pretty good all day - eating salads and eschewing the gorgeous and raved about orange and pistachio carrot cake - and so I have plenty of scope to have another piece or two before bed time. And to those who say that you shouldn't eat carbs after 6pm? Pah phooey! You can also find the origina recipe on the BBC's website. My adaptation is below. If you do the first rise at room temperature, use two sachets of yeast. Additional toppings of your choice (optional) such as sundried tomatoes, sliced olives, prosciutto, chorizo, rosemary, thyme etc (but not all of them at once! Place the flour, salt, yeast, olive oil and 300ml water into a large bowl. 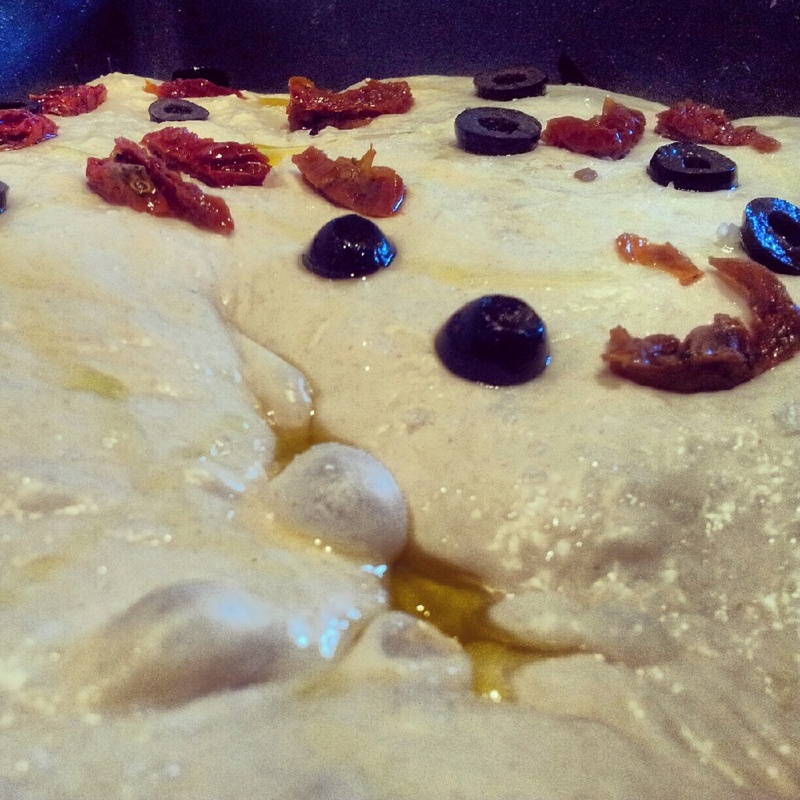 Gently mix to form a soft dough then knead the bowl for five minutes, gradually adding the remaining water. The dough will be really soft and sticky so knead gently in the bowl for a further five minutes. Lightly oil your work surface and knead for a further five minutes. Return to the bowl, cover with clingfilm and place in the fridge for 8-12 hours. Preheat the oven to 220C/200C fan/Gas 7. Drizzle the loaf with oil, sprinkle with sea salt and your other toppings if using then bake in the oven for 20-25 minutes until golden. Cool slightly on a wire rack (it gets sweaty if left in the tin) then serve whilst still warm.